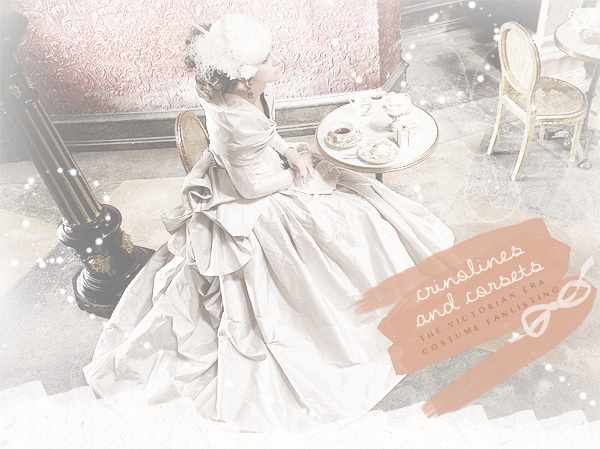 Welcome to Crinolines and Corsets, the TFL.org approved fanlisting for Victorian Era Costumes, listed under the Fashion/Beauty: Clothing and Shoes and History/Royalty: Artifacts and Objects categories. If you are a fan of this beautiful type of garment please feel free to read over the rules, grab a code and join! Crinolines and Corsets was formerly owned by and adopted from the lovely Kim. If you have any questions, donations or wish to become affiliates please email me. Crinolines and Corsets is run by Iris. There are currently 460 fans of Victorian Era Costumes with 0 fans waiting to be added with the next update. Crinolines and Corsets was last updated on 06th March 2019. Give a warm welcome to our newest member(s), Carla ! Crinolines and Corsets: The Victorian Costume fanlisting. Part of Written-Sins.org. Open since February 14, 2005. No copyright infringement intended. All images � to their respective owners.